Grant Morrison, in all honesty, is not that great a writer. His strength, which is also his greatest weakness, is his ability to generate ideas. A Grant Morrison story doesn't have a plot so much as it has characters announcing things. "Here come the sound-armored whales of Armageddon! But there's no time! We have to reverse the polarity of the Wold-Newton Engines before the sentient handshakes cross the grape-flavored breach in the barrier built of solid time!" And so forth. He's certainly not bad, just not as good as the net hype would have you believe. If he could actually just take one of these ideas and turn it into a real story (like the editors at Marvel forced him to do, or like he did for 7 Soldiers of Victory), it might be fun to read. Instead, his books are like the Family Guy of comics - all allusions and throwaways. Just with less humor and more pretention. However, DC found a way to use that to their advantage: they hired Morrison for his ideas, then farmed those ideas out to writers suited to handle them. His idea for turning the Atom into a scientific adventurer, for instance, meshed perfectly with a rejected proposal Gail Simone had sent in for Kid Flash, so she was tapped to take the idea and help it grow. Ryan Choi, the third man to don the costume of the hero the Atom, is a brilliant scientist mastering the manipulation of mass and weight control. He is his own most daring experiment: a hero-in-the-works. The all-new Atom isn't really a superhero - in fact, he could care less about being the Atom. Ryan Choi always wanted to be a scientist when he grew up, and idolized Ray Palmer. The two corresponded for years, and Palmer apparently chose Choi to be his successor, in both civilian and heroic identities. He initially was just taking over Ray's teaching position at the university in Ivy Town, but a series of cryptic clues led Ryan to a hidden size-changing belt, suggesting that he was intended to take over for the Atom, as well. The Silve Age Atom had a very simple, straightforward costume - just sections of red and blue. The modern Atom keeps the colorscheme, but that's about it. The costume, designed by series inker Trevor Scott, is more complex - not "straps and pouches" complex, but graphically complex. The red and blue sections interact more. His size belt is larger and more complex, and he has some kind of metallic device on his back. The pattern on the figure isn't quite right: the red should come up higher onto his shoulders, and there shouldn't be red stripes on his knees, since those were a later addition. 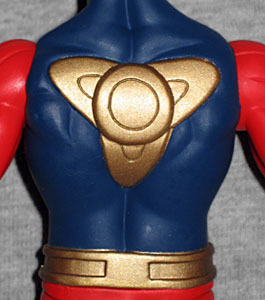 And if this is truly a "First Appearance" figure, the symbol on his belt and forehead should be the classic Atom symbol, not the new three-pronged version. The gold paint apps of his equipment spill onto the blue areas a little bit, and the edges of his mask are ragged. 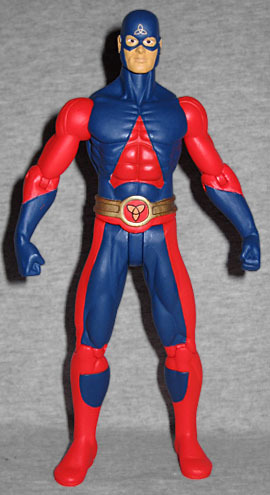 Atom was sculpted by Barsom Manashian, who finally has a last name. The little guy is more muscular than his predecessor, yet also thinner - Ray had a bigger body, but Ryan is better defined. The two figures are the same height - about 6⇁" - and move at the same joints. The new Atom's balljointed neck and shoulders seem to have an improved range of motion, however. He definitely looks Asian, but in a subtle, realistic way; that isn't some stereotypical, slant-eyed "Chinaman" face under the mask. He does look rather calm and determined, which isn't how the character appears in the comics most of the time. Remember, he's a new hero, so he's more often amazed or frightened by what's happening to him. The head seems small, though. Sadly, the Atom does not have any accessories. 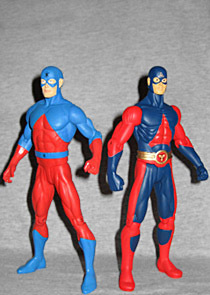 The Ray Palmer figure came with two smaller versions of the character, which would have been a nice tradition to continue. Ryan uses a device called a "Bangstick" and his poker buddies - all brilliant scientists who are also on the faculty of Ivy University - have built him a slew of high-tech equipment. Really, he could have easily come with something. The First Appearance figures don't even come with tiny reprint comics any more. A plain disc base just doesn't cut it. The new Atom first appeared in a Brave New World, an 80-page tryout issue that debuted six (or seven) new concepts that were soon to have their own books. Due to a miscommunication, cover artist Ariel Olivetti did not make Atom look very Asian in the first draft of the cover, so a whole bunch of promo art went out with the wrong face. 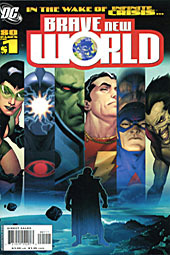 The final cover was rocking the right ethnicity, but that change led to a rumor that DC had switched Ryan's race on a whim, as some kind of four-color affirmative action. That is definitely not true: the Atom has always been Chinese (and one quarter Korean). Part of DC's new diversity, Atom has gotten somewhat overlooked by fans, just like Blue Beetle. There's a huge contingent of fans who will never accept him just because he's not Ray Palmer - they can't understand why there has to be a Chinese guy in the suit. They want their personality-free white guys back, dagnabbit! But really, they're the ones missing out. The All-New Atom has a real vibe of Silver Age fun, just with a smarter voice behind it. So ditch the Old West attitudes and give the Atom a try.